Rebekah Wall is a socially engaged artist; without an audience her work cannot exist. I met her in her home in County Kerry, where her studio is based, to talk to her about her practice. Rebekah believes that art can be anything, created by anyone, at any place, at anytime, as long as there is a genuine reason or purpose behind what is being created. She believes that art should be about generosity and exchange and this comes through a lot in her work, which is very much about identity – locality and heritage as well as gender identity. After college Rebekah worked a lot with organic materials and her work mostly focused on gender identity. Recently she has begun to consider more closely the home and the role of the woman. An exhibition that explored this concept was Breaking Bread in 2012, which was held in Siamsa Tíre Gallery in Tralee. For this exhibition Rebekah made what she described as sculptures similar to those of the sacred heart. 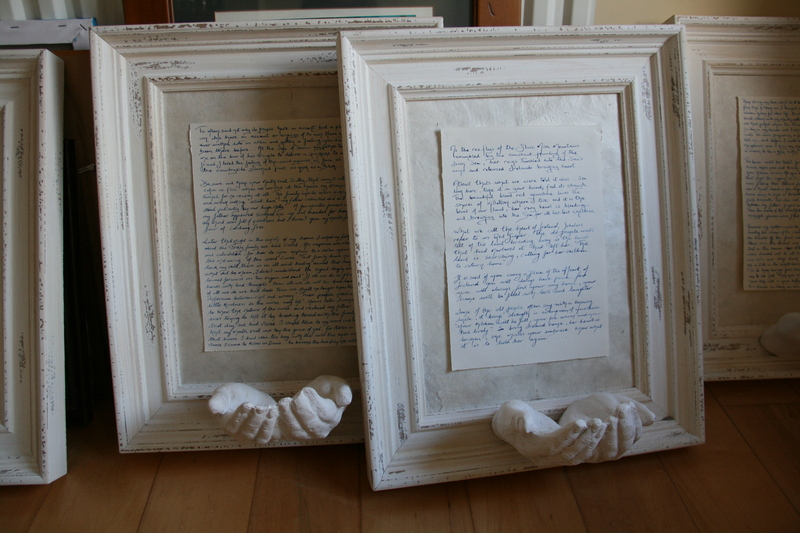 Molded hands emerged from beneath framed hand-written texts on the wall. These texts told the story of Sally Murphy’s childhood, an alter ego that Rebekah has developed over the years. Sally Murphy lived beside the sea and through her mother’s stories her life and beliefs were formed around it. The piece continued to grow during the exhibition because as people came to the gallery they told Rebekah stories that they had been told when growing up and Rebekah documented these so as to pass them on through her work in the future. Rebekah believes that this will help in giving people back their roots and a sense of belonging to a place. There was a performative element to this work on the evening of the opening of the exhibition. During that day Rebekah and her own grandmother had baked one hundred loaves of bread that they then brought to the gallery and stacked on top of an old kitchen table, onto which Rebekah had carved out a text outlining the importance of the mother in a family. Visitors were invited to take a loaf home with them. This included them as an integral part of the exhibition by allowing the work to spread a sense of home and real nourishment beyond the exhibition. This was not the first work of Rebekah’s in which Sally Murphy made an appearance. 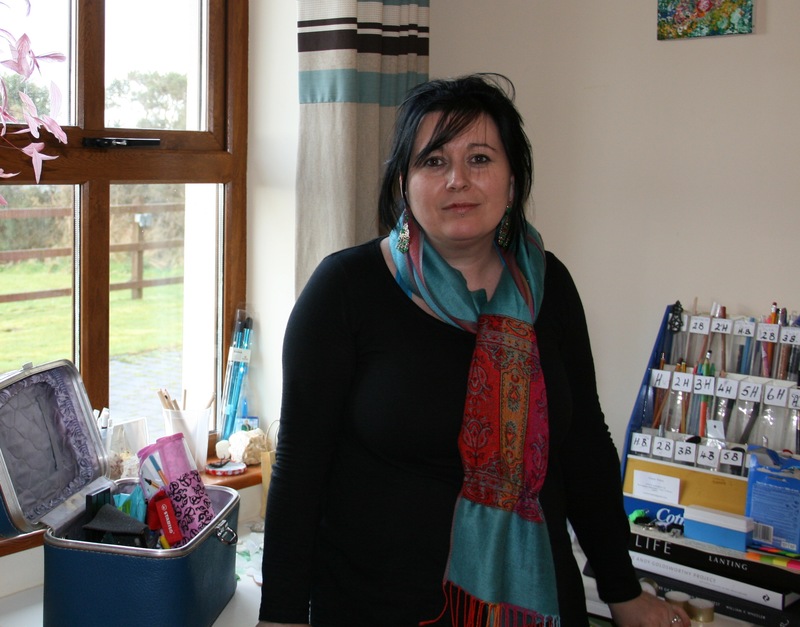 When Rebekah was completing her masters in Social Practice and the Creative Environment in Limerick Institute of Technology she began to look at the internet as a source through which she could sell her art. Making art and making money are two things that people seldom see as going hand-in-hand but Rebekah wanted to see if it was something she could do. Rebekah had a collection of documented stories told to her as a child by her grandmother about life and how to deal with certain things in life through old fairytales. She wanted to see if it was possible to make art relating to these stories and sell them together via the internet, so she set up a website to sell certain items from the beach that related to those stories. She explained that she was an artist looking to make a living through her art, which was created to continue and spread old stories from Ireland about life, morality and history. Nobody bought anything. 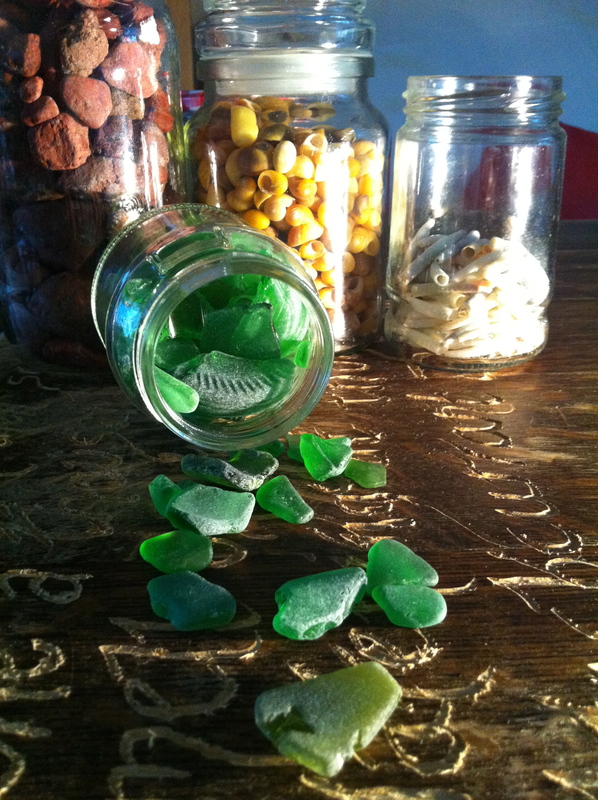 Glass that Rebekah found along the shoreline used in her online project. Image courtesy of the artist. This made Rebekah re-evaluate the project and so she took on the persona of Sally Murphy, an 83 year-old woman living in a cottage by the sea in Ireland who wanted to “give Ireland back to the people that had lost it”. She sold jars of sand, glass, shells, and even air to people over the internet. Rebekah said that she could not keep up with the demand on the website. This made her realise that a lot of what people see is a particular persona, all these people bought into the alternate reality of Sally Murphy who was selling the exact same thing as the young artist Rebekah Wall. She found it intriguing how a certain persona attracts a certain type of audience. 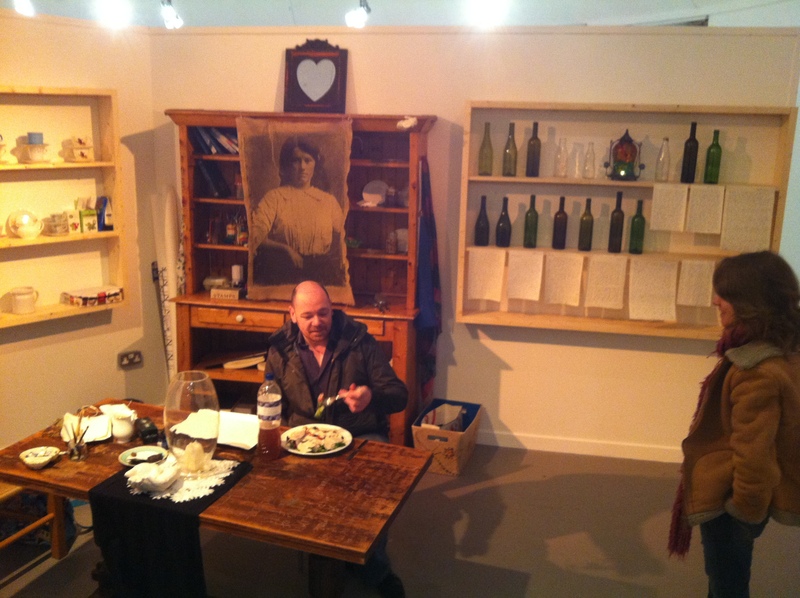 A recent exhibition that Rebekah took part in was in the form of a ‘live studios’ in Siamsa Tíre gallery. Along with two other artists Rebekah spent three weeks using the gallery space as her studio during which the audience were invited to come in and interact with the artists. Rebekah set up a kitchen table in the studio and invited people to come in and sit down with her while she asked them a selection of questions. Some people said that they felt it was too personal and left, others poured their heart out to her. 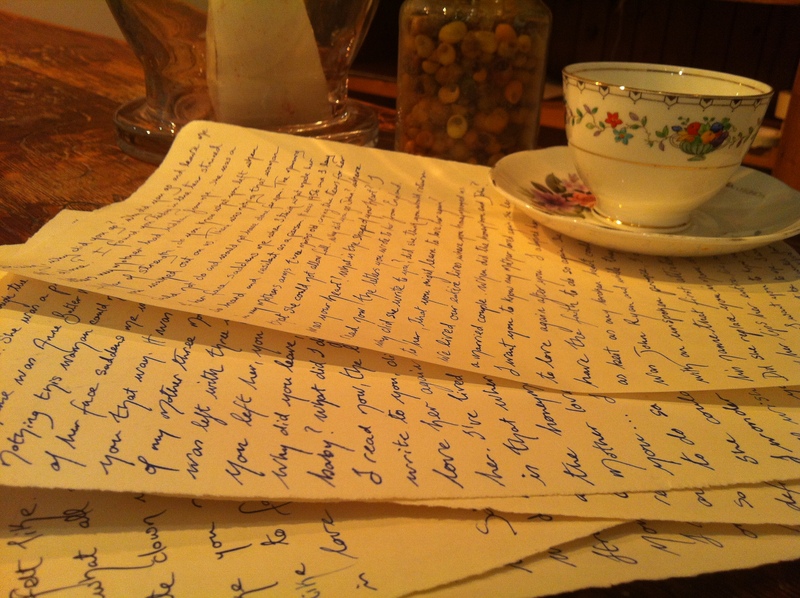 Based on what they told her, Rebekah wrote a letter on their behalf that was then placed in a bottle that was cast out to sea at the end of March, fifty miles from the coast of Dingle. 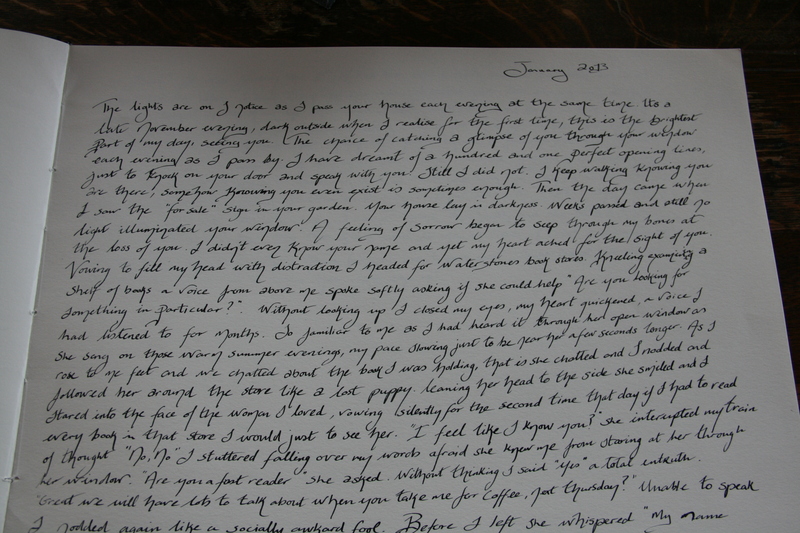 Letters Rebekah send out to sea in bottles, 2013. Image courtesy of the artist. She is currently working on getting a sponsor for the first five bottles found so the people who find them will be brought to Ireland for a week. Rebekah will meet them and teach them about Irish history and folklore. She said that this project could easily outlive her and she hopes that if it does, some day, someone who may not even be born yet will knock on the door of one of her sons’ houses and say that they found a letter in bottle written for someone by their mother. She sees it as a way of casting something from the past into the future. Rebekah’s “live studio” in Siamsa Tíre Gallery, 2013. Image courtesy of the artist. 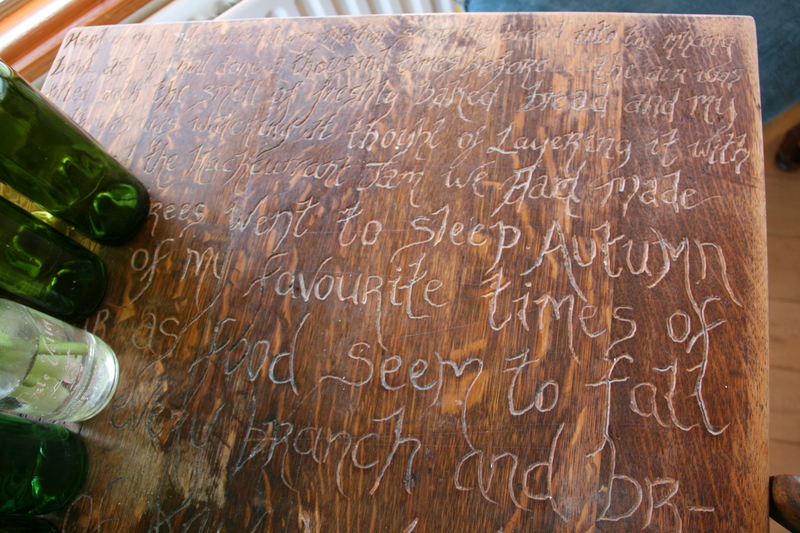 Of all the stories from people who visited her studio in the gallery, one particularly stood out for her. It was a story told to her by a man who had never told the story in his life before. He explained to Rebekah how he had fallen in love with a woman he had only seen but never spoken to. They met by chance one day in a bookshop after he thought he would never see her again and they are still married today. There were many other touching and some heartbreaking stories told to Rebekah over the course of the live studios and so she has now begun to write certain stories into a book that she plans to publish as a book of 100 Love Stories. Rebekah sees open conversations about work to be an integral part of an artist’s practice and through her teaching in both primary and secondary schools she has been able to continue to foster this with her students. She finds teaching to be an important part of her own practice as well because it has given her the opportunity to look at things in a different way and have conversations with a diverse range of people. She does not find the hierarchical method of teaching to be beneficial and encourages everyone to see their ideas as equal, irrespective of age or qualifications. This is one of the reasons Rebekah became involved in the art collective known as Babytag. Rebekah, together with two other artists, saw that there was a need in Kerry for somewhere artists could gather and discuss their work openly with their peers. They wanted to create a community where artists could come to get help and support or receive honest feedback about their work. As a collective Babytag have hosted a number of pop-up exhibitions over the past few years and although each of the artists take time out to focus on their own practices the collective continues to form links with artists in the locality and further afield. Rebekah, I have enjoyed to read about your work. Your projects are revealing and show the potential and the possibilities of contemporary art today. well done, James P kinsella.